"America's Sweetheart," "The Girl With The Curls"
Mary Pickford (April 8, 1892 – May 29, 1979) was an Oscar-winning Canadian motion picture star and co-founder of United Artists in 1919. She was one of the first Canadian pioneers in early Hollywood and an outstanding influence in the development of film acting. Since her international fame was triggered by moving pictures and the resultant publicity, she is a watershed figure in the history of modern celebrity. As one of silent film's most important performers and producers, her contract demands were central to shaping the Hollywood industry. Her innocent but errant portrayals of feisty young ingénues pitted against a cruel world earned her the sobriquet, "America's Sweetheart." Pickford was the first to adapt acting for the screen by employing natural and realistic expressions and gestures. However, it was her innate talent for performing both comedy and tragedy in the newly developing medium of film that captured the imagination of the public and revolutionized acting forever. Her much publicized marriage to Douglas Fairbanks catapulted them into the public limelight and to a level of stardom never seen before in entertainment. The press coined them "Hollywood royalty." However, the pressures of fame from Hollywood's new image making industry, one that allowed the public an intimate view of the stars but also deprived them of privacy, took its toll on the couple and they eventually divorced. With the advent of "talking pictures" Mary Pickford faded into near obscurity. Today, however, she is recognized as an indefatigable pioneer of the motion picture industry. She has been called, "the woman who made Hollywood." Mary Pickford was born Gladys Louise Smith in Toronto, Ontario, Canada. Her father, John Charles Smith, was the son of British Methodist immigrants. Her mother, Charlotte Hennessy, was from an Irish Catholic family. She had two younger siblings, Jack and Lottie Pickford, who would also become actors. Glady's father, an alcoholic, left his family in 1895, and died three years later of a cerebral hemorrhage after a boating accident. Charlotte, who worked as a seamstress to make ends meet also took in boarders. Through one of these lodgers, Gladys, aged seven, won a bit part at Toronto's Princess Theatre in a stock company production of The Silver King. She subsequently took on other minor roles. As the oldest child in her family she felt a keen sense of responsibility to take care of her siblings and help her mother provide an income for their nearly destitute family. Acting soon became a family enterprise as Charlotte, Gladys, and her two younger siblings Jack and Lottie, toured the United States by rail and performed in rag-tag melodramas. After six impoverished years of touring, Gladys and her mother headed for Broadway. She landed a supporting role in a 1907 Broadway play, The Warrens of Virginia. The play was written by William C. DeMille, whose brother, the then unknown Cecil B. DeMille also appeared in the cast. David Belasco, the producer of the play, insisted that Gladys Smith assume a name with more charisma. Drawing on family names they came upon "Pickford." With the stage name, "Mary Pickford," a star was born and a new precedent had been set. I played scrubwomen and secretaries and women of all nationalities. I took anything that came my way because I decided that if I could get into as many pictures as possible, I'd become known, and there would be a demand for my work. In 1909, Pickford appeared in 51 films—almost one a week. Her comic blend of sweetness and feistiness made her not only Biograph's most important player, but the most popular star of the nickelodeon era when silent movies were referred to as "flickers." In January 1910 Pickford traveled with a Biograph crew to Los Angeles where sunnier skies provided for longer shooting days. Pickford's name was not listed in the credits, as was customary for the times, but she had been noticed by audiences within weeks of her first film appearance. Exhibitors capitalized on her popularity by advertising on sandwich boards outside their nickelodeons that a film featuring "The Girl with the Golden Curls," was inside. Pickford left Biograph in December 1910, and spent 1911 with the Independent Motion Picture Company (later Universal) and Majestic. Unhappy with their creative standards, she returned to work with Griffith in 1912. Uncertain whether her future lay in film or theater, she made her last Biograph film, The New York Hat. She also starred on Broadway in the David Belasco production of A Good Little Devil. This experience turned out to be a major turning point in her career, as she then decided to devote her energies exclusively to film. In the same year, Adolph Zukor formed Famous Players in Famous Plays (later Paramount), one of the first American feature film companies. She instantly attracted a devoted following, appearing in such comedy-dramas as In the Bishop's Carriage (1913) and Hearts Adrift (1914). Her appearance as a tomboyish guttersnipe in 1914's Tess of the Storm Country, a film shown on four continents, brought her international recognition. Pickford remained Hollywood's biggest female star throughout the silent era, earning the right not only to act in her own movies, but to produce them and control their distribution. She was also the first female actor to receive more than one million dollars per year. Although she played mostly adolescents and young girls, sometimes even being cast in the role of a child, Pickford resisted being typecast. In Frances Hodgson Burnett’s Little Lord Fauntleroy (1921), she played two parts: that of the mother and the son, (appearing on the screen at the same time) not only a revolutionary special effect for that time but one that showed the extent of her talent as an actress. The arrival of sound, however, proved to be a difficult adjustment for Pickford. In her first "talkie," Coquette (1929), she played reckless socialite; a role for which she cut her famous hair into a 1920s bob. Pickford's hair had become a symbol of female virtue, and cutting it made front-page news in the New York Times. With her updated look, Pickford intended to signal to her adoring public that her portrayal of young girls was over. Though she won the Academy Award for Coquette, the public failed to respond to her work in roles that were more suited to her own age. Now in her forties, Pickford was unable to play the teenage spitfires so adored by her silent-film fans; nor could she play the soigné heroines of early sound. She retired from acting in 1933, though she continued to produce films for others, including Sleep My Love (1948), an update of Gaslight with Claudette Colbert. Pickford was married three times, the first to Irish-born silent-film actor Owen Moore in 1911. The couple struggled with both Moore's alcoholism and with the marked disparity in their career status. They lived apart for several years and it was during that time that Pickford would become secretly involved in a relationship with Douglas Fairbanks. Fairbanks, a popular former Broadway actor, was a rising star who was gaining recognition through his appearance in a series of light, satiric comedies. 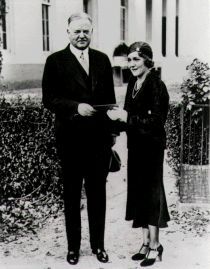 By the time the couple toured the U.S. promoting Liberty Bonds during World War I, their romance was well established. However, they kept their relationship secret from their fans for fear of alienating them, since they were both still married to others. Pickford finally divorced Moore on March 2, 1920, and married Fairbanks on March 28 of the same year. On their European honeymoon they were besieged by fans who incited near rioting in an attempt to touch Pickford's hair and clothes. In Paris, a similar encounter erupted at an outdoor market and a frightened Pickford had to be rescued. The couple's triumphant return to Hollywood was witnessed by vast crowds who turned out to hail them at railway stations across the United States. While Pickford continued to epitomize the spunky girl next door in her movies, The Mark of Zorro (1920) and a series of other spectacular swashbucklers gave the popular Fairbanks a more romantic and heroic image. Together, they seemed to be the ultimate symbols of optimistic American values. European heads of state and dignitaries would visit the White House, then ask to visit Pickfair, the couple's mansion in Beverly Hills. Dinners at Pickfair were legendary. Guests included: George Bernard Shaw, Albert Einstein, Elinor Glyn, Helen Keller, H.G. Wells, Lord Mountbatten, Fritz Kreisler, Amelia Earhart, F. Scott Fitzgerald, Noel Coward, Max Reinhardt, Sir Arthur Conan Doyle, Austin Chamberlain and Sir Harry Lauder. Nonetheless, the public nature of Pickford's second marriage put a strain on their relationship. Both she and Fairbanks had little time off from producing and acting in their films. When they weren't acting or tending to United Artists’ business, they were constantly on display as America's unofficial ambassadors to the world—leading parades, cutting ribbons, and making speeches. On June 24, 1937, Mary Pickford married her last husband, actor and band leader Charles 'Buddy' Rogers. They adopted two children, Roxanne (born 1944, adopted 1944) and Ronald Charles (born 1937, adopted 1943). Though she took on various producing projects, she was never able to regain the artistic life or the public stature that she enjoyed during the silent film era. Additionally, she still had not recovered from a series of personal losses: her mother Charlotte in March 1928 (to breast cancer); her brother Jack in 1933 and sister Lottie in 1936 (each due to general dissipation and alcoholism), and ex-husband, Douglas Fairbanks in 1939 (to a stroke). Fairbanks, at least on some level, was still the love of Pickford's life, and upon hearing of his death, she reportedly began to weep in front of her new husband, Rogers, saying "My darling is gone." Pickford and Rogers stayed together for over four decades until Pickford's death from a cerebral hemorrhage at the age of 87. Born to a Methodist father and a Catholic mother, Pickford was baptized into both denominations, but she was raised as a Catholic. Her devotion to her Catholic religious beliefs about marriage and divorce was the main reason she stayed in an abusive relationship with her first husband. After the death of her mother Charlotte, Pickford was distraught but felt she could not turn to the Catholic Church for comfort. She found solace in Christian Science and became a devout convert to the faith. Pickford wrote an inspirational book titled Why Not Try God? (1934), which mixed Christian Science wisdom with her own personal testimony of God and healing and was written to help guide people through the kind of crises she had faced. When published in 1934, it sold over fifty thousand copies. Her third husband, Charles "Buddy" Rogers, was also a Christian Scientist. 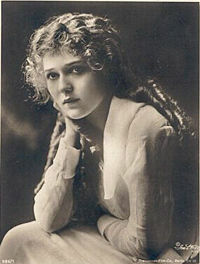 Mary Pickford was at one time a leader of the Episcopal Actors' Guild. The organization is affiliated with the Episcopal Church, but it also has the motto, "Charitable help for performers of all faiths, and none." During the Roaring Twenties, the Guild served as a social and artistic center for its members while quietly assisting those in need. In addition to Pickford, other leaders of the Guild included George Arliss, Douglas Fairbanks, Minnie Maddern, and Julia Marlowe. During the early years several future stars were helped at crucial times in their careers, and later generously remembered the Guild with contributions and bequests. An astute businesswoman, Pickford became her own producer within three years of starting her career in movies. She was eventually—through United Artists—to have complete control of budget, casting, costumes, directors, writers, and the entire process of filmmaking. Pickford first demanded these powers in 1916, when she was under contract to Adolph Zukor's Famous Players in Famous Plays (later Paramount). He also agreed to her refusal to participate in block-booking, the widespread practice of forcing an exhibitor to show a bad film of the studio's choosing in order to also show a Pickford film. In 1919, she increased her power by co-founding United Artists (UA) with Charlie Chaplin, D. W. Griffith, and her soon-to-be husband, Douglas Fairbanks. At that time, the Hollywood studios were vertically integrated; they were not only producing films but forming chains of theaters in which to show them. Filmmakers relied on the studios for bookings; in return they put up with what many considered creative interference. United Artists did not produce films; it was solely a distribution company, offering independent film producers access to its own screens as well as the rental of temporarily un-booked cinemas owned by other companies. Pickford and Fairbanks produced and shot their films after 1920 at the jointly-owned Pickford-Fairbanks studio on Santa Monica Boulevard. The producers who signed with UA were true independents; producing, creating, and controlling their work to an unprecedented degree. As a co-founder, as well as the producer and star of her own films, Pickford became the most powerful woman who had ever worked in Hollywood. She was known to be a perfectionist and with each picture that she made she attempted to set a new standard. When she retired from acting in 1933, Pickford continued to produce films for United Artists, and she and Charlie Chaplin remained partners in the company for decades. Chaplin left the company in 1955, and Pickford followed suit in 1956, reluctantly selling her remaining shares. Pickford's mother, Charlotte, who was known to be her strong supporter and adviser, died of cancer in March 1928. Within a few years, Lottie and Jack died due to alcohol-related causes. These deaths, her divorce from Fairbanks, and the end of silent films left Pickford deeply depressed. As a PBS "American Experience" documentary noted, Pickford's relationship with her children was turbulent as they grew into teenagers. Both married at a young age and left Pickfair. Gradually, Pickford became a recluse, remained almost entirely at Pickfair, and allowed visits only from Lillian Gish, her stepson Douglas Fairbanks, Jr., and a few select others. In the mid-1960s, she often received visitors only by telephone, speaking to them from her bedroom. Buddy Rogers often gave guests tours of Pickfair, which included viewing a portrait of Pickford in the drawing room. Painted at the height of her fame, it emphasizes her girlish beauty and spun-gold curls. A print of this image now hangs in the Library of Congress. Before her death Pickford petitioned the Canadian government to restore her Canadian citizenship, which she believed had been lost when she became a U.S. citizen upon her marriage to Fairbanks in 1920. As a result, long before it became fashionable to do so, Pickford became a dual citizen. She died on May 29, 1979, at the age of 87, and was buried in the Garden of Memory in the Forest Lawn Memorial Park Cemetery in Glendale, California. Buried alongside her in the Pickford private family plot are her mother Charlotte, and her siblings, Lottie and Jack Pickford. Pickford—setting another important precedent—used her stature in the movie industry to promote a variety of causes. During World War I, she was the most prominent film star to promote the sale of Liberty Bonds, touring with Charlie Chaplin, Douglas Fairbanks, and Marie Dressler. Though Canadian-born, Pickford was a powerful symbol of American patriotism, kissing the American flag for cameras and auctioning one of her world-famous curls for $15,000. At the end of World War I, Pickford conceived of the Motion Picture Relief Fund, an organization to help financially needy actors. In 1921, the Motion Picture Relief Fund (MPRF) was officially incorporated. In 1932, Pickford spearheaded the "Payroll Pledge Program," a payroll deduction plan for studio workers who gave one-half of one percent of their earnings to the MPRF. As a result, in 1940 the fund was able to purchase land and build the Motion Picture Country House and Hospital. Pickford's most profound influence was to help re-shape the film industry itself. In response to her astonishing popularity, Hollywood re-thought its vision of features as "canned theater," and focused instead on actors and material that were uniquely suited to film, not the footlights. Pickford and Fairbanks were the first actors to leave their handprints in the courtyard cement at Grauman's Chinese Theatre. In addition to her Oscar for best actress for Coquette (1929), Mary Pickford received an Academy Honorary Award for Lifetime Achievement in 1976. In 2006, along with fellow deceased Canadian stars Fay Wray, Lorne Greene and John Candy, Pickford was featured on a Canadian postage stamp. The American Film Institute named Pickford 24 among the greatest female stars of all time in AFI's 100 Years...100 Stars. The Violin Maker of Cremona. June 7, 1909. The Lonely Villa. June 10, 1909. The Son's Return. June 14, 1909. Faded Lilies. June 14, 1909. Her First Biscuits. June 17, 1909. The Peach-Basket Hat. June 24, 1909. The Way of Man. June 28, 1909. The Necklace. July 1, 1909. The Country Doctor. July 8, 1909. The Cardinal's Conspiracy. July 12, 1909. The Renunciation. July 19, 1909. Sweet and Twenty. July 22, 1909. The Slave. July 29, 1909. A Strange Meeting. August 2, 1909. They Would Elope. August 9, 1909. His Wife's Visitor. August 19, 1909. The Indian Runner's Romance. August 23, 1909. Oh, Uncle! August 26, 1909. The Seventh Day. August 26, 1909. The Little Darling. September 2, 1909. The Sealed Room. September 2, 1909. 1776 or The Hessian Renegades. September 6, 1909. Getting Even. September 13, 1909. The Broken Locket. September 16, 1909. In Old Kentucky. September 20, 1909. The Awakening. September 30, 1909. The Little Teacher. October 11, 1909. His Lost Love. October 18, 1909. In the Watches of the Night. October 25, 1909. What's Your Hurry? November 1, 1909. The Gibson Goddess. November 2, 1909. The Restoration. November 8, 1909. The Light That Came. November 11, 1909. A Midnight Adventure. November 18, 1909. The Mountaineer's Honor. November 25, 1909. The Trick That Failed. November 29, 1909. The Test. December 16, 1909. To Save Her Soul. December 27, 1909. All on Account of the Milk. January 15, 1910. The Woman From Mellon's. February 3, 1910. The Englishman and the Girl. February 17, 1910. The Newlyweds. March 3, 1910. The Thread of Destiny. March 7, 1910. The Twisted Trail. March 24, 1910. The Smoker. March 31, 1910. As It Is In Life. April 4, 1910. A Rich Revenge. April 7, 1910. A Romance of the Western Hills. April 11, 1910. The Unchanging Sea. May 5, 1910. Love Among the Roses. May 9, 1910. The Two Brothers. May 14, 1910. In the Season of Buds. June 2, 1910. A Victim of Jealousy. June 9, 1910. A Child's Impulse. June 27, 1910. May and December. June 30, 1910. Muggsy's First Sweetheart. June 30, 1910. Never Again! June 30, 1910. What the Daisy Said. July 11, 1910. The Call to Arms. July 25, 1910. An Arcadian Maid. August 1, 1910. When We Were In Our 'Teens. August 15, 1910. The Sorrows of the Unfaithful. August 22, 1910. Willful Peggy. August 25, 1910. Muggsy Becomes a Hero. September 1, 1910. A Gold Necklace. October 6, 1910. The Masher. October 13, 1910. A Lucky Toothache. October 14, 1910. Waiter No. 5. November 5, 1910. Simple Charity. November 14, 1910. Song of the Wildwood Flute. November 21, 1910. A Plain Song. November 28, 1910. White Roses. December 22, 1910. When A Man Loves. January 5, 1911. The Italian Barber. January 9, 1911. Three Sisters. February 2, 1911. A Decree of Destiny. March 6, 1911. Their First Misunderstanding. January 9, 1911. The Dream. January 23, 1911. Maid or Man. January 30, 1911. At the Duke's Command. February 6, 1911. The Mirror. February 9, 1911. While The Cat's Away. February 9, 1911. Her Darkest Hour. February 13, 1911. Artful Kate. February 23, 1911. A Manly Man. February 27, 1911. The Message in the Bottle. March 9, 1911. The Fisher-Maid. March 16, 1911. In Old Madrid. March 20, 1911. Sweet Memories. March 27, 1911. The Stampede. April 17, 1911. Second Sight. May 1, 1911. The Fair Dentist. May 8, 1911. For Her Brother's Sake. May 11, 1911. The Master and the Man. May 15, 1911. The Lighthouse Keeper. May 18, 1911. Back to the Soil. June 8, 1911. In the Sultan's Garden. July 3, 1911. For the Queen's Honor. July 6, 1911. A Gasoline Engagement. July 10, 1911. At a Quarter of Two. July 13, 1911. The Skating Bug. July 31, 1911. The Call of the Song. August 13, 1911. The Toss of a Coin. August 31, 1911. 'Tween Two Loves. September 28, 1911. The Rose's Story. October 2, 1911. The Sentinel Asleep. October 9, 1911. The Better Way. October 12, 1911. His Dress Shirt. October 30, 1911. From the Bottom of the Sea. November 20, 1911. The Courting of Mary. November 26, 1911. Love Heeds Not the Showers. December 3, 1911. Little Red Riding Hood. December 17, 1911. The Caddy's Dream. December 31, 1911. Honor Thy Father. February 9, 1912. The Mender of Nets. February 15, 1912. Iola's Promise. March 14, 1912. Fate's Interception. April 8, 1912. The Female of the Species. April 15, 1912. Just Like a Woman. April 18, 1912. Won By a Fish. April 22, 1912. The Old Actor. May 6, 1912. A Lodging for the Night. May 9, 1912. A Beast at Bay. May 27, 1912. Home Folks. June 6, 1912. Lena and the Geese. June 17, 1912. The School Teacher and the Waif. June 27, 1912. An Indian Summer. July 8, 1912. The Narrow Road. August 1, 1912. The Inner Circle. August 12, 1912. With the Enemy's Help. August 19, 1912. A Pueblo Legend. August 29, 1912. So Near, Yet So Far. September 30, 1912. A Feud in the Kentucky Hills. October 3, 1912. The One She Loved. October 21, 1912. My Baby. November 14, 1912. The Informer. November 21, 1912. The New York Hat. December 6, 1912. The Unwelcome Guest. March 15, 1913. In the Bishop's Carriage. September 10, 1913. Hearts Adrift. February 10, 1914. A Good Little Devil. March 1, 1914. Tess of the Storm Country. March 30, 1914. The Eagle's Mate. July 1, 1914. Such a Little Queen. September 21, 1914. Behind the Scenes. August 26, 1914. Mistress Nell. February 1, 1915. Fanchon, The Cricket. May 10, 1915. The Dawn of a Tomorrow. June 7, 1915. Little Pal. July 1, 1915. A Girl of Yesterday. October 7, 1915. Madame Butterfly. November 8, 1915. The Foundling. January 2, 1916. Poor Little Peppina. March 2, 1916. The Eternal Grind. April 17, 1916. Hulda From Holland. July 31, 1916. Less Than the Dust. November 2, 1916. The Pride of the Clan. January 8, 1917. The Poor Little Rich Girl. March 5, 1917. A Romance of the Redwoods. May 14, 1917. The Little American. July 2, 1917. Rebecca of Sunnybrook Farm. September 3, 1917. The Little Princess. November 12, 1917. Stella Maris. January 21, 1918. Amarilly of Clothes-line Alley. March 10, 1918. How Could You, Jean? June 23, 1918. Johanna Enlists 5 reels. September 15, 1918. Captain Kidd, Jr. April 21, 1919. The Hoodlum. September 1, 1919. The Heart o' the Hills. December 1, 1919. The Love Light. January 9, 1921. Through the Back Door. May 17, 1921. Little Lord Fauntleroy. September 16, 1921. Tess of the Storm Country. November 12, 1922. Dorothy Vernon of Haddon Hall. May 25, 1924. Little Annie Rooney. September 18, 1925. My Best Girl. November 13, 1927. The Taming of the Shrew. October 26, 1929. Pickford, Mary. Why not try God? New York: H. C. Kinsey & Company, Inc. 1934. Pickford, Mary. Why not Look Beyond? London: Methuen. 1936. ↑ Filmbug, Mary Pickford. Retrieved August 9, 2007. ↑ Internet Movie Database, Biography for Mary Pickford. Retrieved August 9, 2007. ↑ Golden Silents, Mary Pickford. Retrieved August 9, 2007. ↑ Adherents.com, The Religious Affiliation of Mary Pickford, Great American Actress, Film Producer and Studio Chief. Retrieved August 9, 2007. ↑ U-S-History.com, Mary Pickford. Retrieved August 9, 2007. ↑ PBS, Buddy Rogers, mary Pickford and Their Children. Retrieved August 9, 2007. ↑ Internet Movie Database, Mary Pickford. Retrieved August 9, 2007. Whitman, Alden. “Mary Pickford is Dead at 86; America's Sweetheart of Films.” New York Times. 1979, page A1. Adherents.com. The Religious Affiliation of Mary Pickford. Internet Movie Database. Mary Pickford. This page was last modified on 30 August 2018, at 14:36.